Pinball FX2 VR’s timed exclusivity with Oculus shortly comes to an end, with the game due to arrive on HTC Vive and PlayStation VR on November 29th. At the same time, the popular Walking Dead-themed table shuffles its way onto all VR versions of the game. As one of the launch titles for the Oculus Rift, Pinball FX2 VR was well received, introducing a realistic perspective to the popular 2010 game, Pinball FX2, which originally launched on Xbox 360. The VR version initially included three new table designs, and has since received a DLC pack with five classic tables. The game was particularly suitable for VR, due to simulating a stationary real-world activity, and one that is enhanced by physically standing up. Thanks to its production quality and decent ball physics, Pinball FX2 completed the transition to VR very effectively. And if you’re a pinball enthusiast, building a PinSim for haptic feedback takes the immersion to the next level. On November 29th, Pinball FX2 VR comes to the HTC Vive and PlayStation VR for $15 (November 30th for PSVR in Europe). Like the Rift version, the DLC with the five classic tables is an additional $25, with more content coming soon. Developer Zen Studios also announced that the Walking Dead table will be available for all three versions on the same day for $7. This popular themed table first came to Pinball FX2 in 2014, with choice-driven gameplay and five ‘episodes’ to play. Having developed two pinball series (Pinball FX and Zen Pinball) for almost a decade, Zen Studios are renowned for their attention to detail, and this table is a great example. It brings the distinctive hand-drawn visual style of Telltale’s adventure series and dialogue from the original voice actors, and the table and environment design has been updated and optimised for VR. 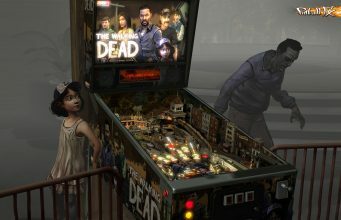 The post ‘Pinball FX2 VR’ Coming to Vive and PSVR Along with Walking Dead Table on November 29th appeared first on Road to VR.